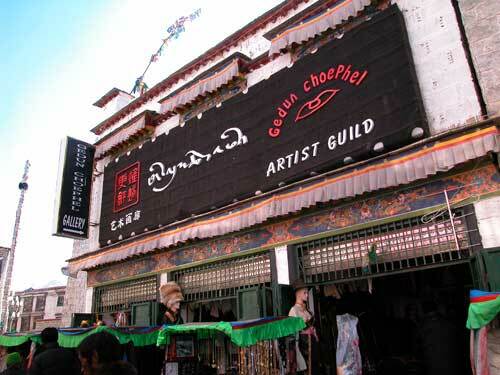 Art galleries have emerged on the streets of Lhasa since the reform and opening up of China. The earliest ones were Art Gallery of Tibetan Exhibition Hall and Art Gallery of Potala Palace 20 years before. For 20 years as one fell, another rose until now, tens of art galleries of various sizes and centred around Barkor Street are attracting enormous numbers of tourists from both home and abroad. As running businesses, the galleries are categorized into three kinds. The first one is to display and sell only new Thangkas; the next is not only to show and sell those archaic and new Thangkas, but also antiques and ethnic handicrafts as well; the last is to exhibit for selling paintings, photos, and installation artworks produced by local artists, while art exhibitions are held periodically, performing just like an art Saloon. In spite of diversity in business contents and regional cultures, there is no doubt that art galleries in Lhasa will help to promote the ethnic Tibetan culture and advance exchanges between Tibetan culture and cultures from both the hinterland and overseas. Entering the labyrinthine lanes in the south of Barkor Street, a small gallery without any name on the signboard caught my eye. The door was wide opened, and various kinds of colorful and splendid Thangkas were hanging on the three walls, catching the attention of all passersby. A teenager, painting Tangka by sitting beside the doorframe, was just like an active advertisement to remind me of what he was doing. 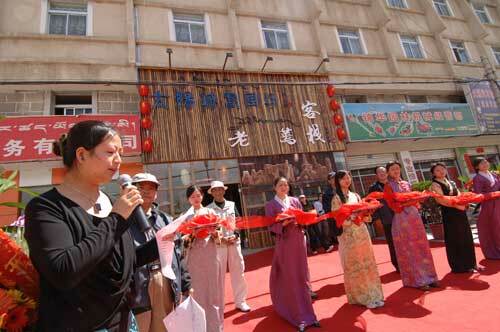 The owner of this gallery was Mr. Dempa, an ethnic Tibetan painter of 30 years from Senggeshong of Qinghai Province. Making his living by skillful painting, he had been in Lhasa with his wife, Drolma, for seven to eight years already. At the very beginning, he worked as casual labor at Art Village. Last year, he independently set up his own business to open this gallery shop running business together with his wife. Ordinarily, Dempa was used to painting Thangkas in his bedroom on the second floor, and Drolma, together with the little apprentice, was running the business downstairs. Although Dempa spoke less Tibetan than me, we still communicated and had no problem to understand each other, if we both spoke slowly. Hearing from me that we were craft brothers, the young man started to be talkative. He said, due to the plight of his parents' family, he got no possibility to study in schools but instead learnt drawing with his master when he was eight years old. Being of the same ability as the other young painters in the countryside of Tibet, Dempa had successfully learnt to paint and was skilled in various kinds of painting of Thangka and fresco. Dempa and others from the countryside had the advantages of vigorous physical strength and energy, but they were weak on communication as they were used to being isolated by themselves and could only speak a little Chinese and nothing of English. Therefore, no matter how good their painting, their business was not as profitable as those galleries run by Chinese or other ethnic businessmen. The biggest, most exquisite Thangka one metre wide in the gallery was only priced at 3000 Yuan. Until now, Dempa had not felt too much disappointment as the unbalanced situation between investment and output. The reason might be that he was born as a Buddhist, and also as a true painter. He, after all, understood the contents and details of the Buddhist paradise that he was painting in Thangkas by taking his own way. He believed that the process of drawing was actually the process to pay his homage to his faith and also he felt honored to be with such merit and virtues. Upon that, facing the limited business, he and his wife took nothing to their hearts. Nevertheless, meals and tea eventually cost money; taking house rent as example, the house owner neither canceled nor offered a discount even through the paintings with Buddha figures covered all the walls. At the end of his rope, Dempa had to entrust, however reluctantly, those prosperous galleries to sell his exquisite drawings. In his words, "(I have to) close my eyes, and asked people to slaughter me. I feel physically painful, but worse is that my heart is burning." When he was asked why there was no signboard for his gallery, as the neighboring barbers' shop and cleaners had, Dempa appeared as an innocent person and said that he had applied. He had no idea that the process had already gone through and still there was no response at all. Before I left, Dempa gave me a name card which was printed with the name of "Art Gallery of Colorful Thangkas in Regong Traditional Culture of Tibet" and also the address as "Room 101, Daxiao Hotel of Barkor Street, Lhasa". The name of this gallery seemed too much verbose, but obviously it could be easily seen that Dempa was not totally ignorant. A three-floor Tibetan building was situated at the north Barkor Street. Several galleries were set up at the ground floor. Shops were arranged at the front of the house but workshops were allocated at the rear. I randomly walked into one named "Manual Thangka Shop of the North Barkor Street". It was a small house (about 20 square metres) propped up by two wood pillars inside. Six to seven young painters were sitting there in a row, and were keeping busy drawing or dyeing Thangkas. In front of them, cups for buttered tea and a number of plates for keeping dyestuff were placed on small tea tables. A radio-recorder constantly played pop songs. Those young men, differing from Dempa as the outsider, were originally from downtown Lhasa or counties close by. The ganger was a 30-year-old called Pasang. He had been painting for 13 years. Taking advantage of locality, these young guys maintained the daily working and resting schedule as the government officers in term of coming at 9 o'clock in the morning and leaving at 7 o'clock in the evening. Pasang told me that their business partners were mainly local Tibetans. They were usually in big demand throughout the whole year. Looking at a huge copy of a fresco, I asked Pasang if this was an order by an organization. He said it wasn't but an individual order. The original of this fresco was actually from Dzongyab Lukhang, which located in the back of the Potala Palace. The person who ordered this copy as he had a feeling that the fresco would be demolished with the passage of time, and therefore he decided to invested money to make a copy. I was so impressed and admiring of his natural consciousness of cultural preservation. Walking backward from the dark house, the glaring sunshine made me blind and I had to take one second to adjust myself. Then, I saw several mountain bicycles and motorcycles were parked close to the door. I guessed those belonged to the young painters working inside. Some of them probably had already driven private cars. The only reason those cars didn't show up was because cars were banned from driving in Barkor Street. I walked eastward from Thangka Art Village, turned to the south, and then reached the corner where Gedun Chophel Art Gallery was situated. This particular gallery focuses on exhibiting the artworks of local youth. The gallery covered all over the double-deck floors. Though the shop was a little bit crowded, it generally looked very modern, and the lights and display designed specially for the space was also dainty. I had been here before to take part in several opening ceremonies. 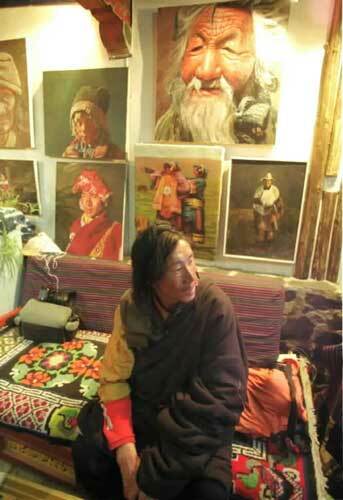 I encountered Norbu Tsering, a Tibetan painter who was working at Tibet Television Station. As observed in recent years, I found he was always intoxicated with painting and modern art, and was a painter with bright future. He told me the gallery was currently run by shareholders. On one hand, individual painters covered all costs, such as rent, electricity, water, advertising and so forth, separately. On the other hand, profits and loss were also directly connected with shareholders in order to motivate the owners' responsibility and accountability. As I was told, most of the artworks were collected by people from the hinterland and overseas. 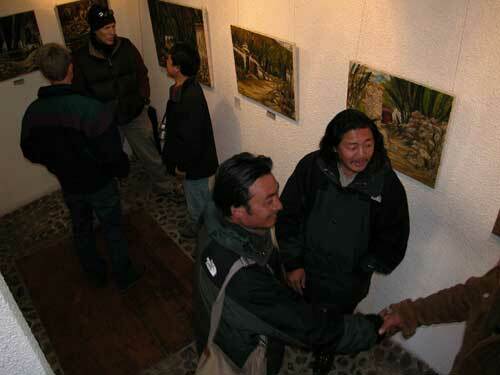 In recent years, some local Tibetans started to make inquiries about the artworks. That was good news, and it showed that the local people in had started to build trust in modern art and concerned with its value as well. 43-year-old Norbu Tsering had a 17-year-old son called Tenzin Shinyi, just came back from Nantong Middle School of Jiangshu to participate in the national entrance examination of universities at Lhasa. Norbu Tsering wished his son could be enrolled by one of the universities in Beijing, and claimed that he could also go with his son to Beijing for a training program in order to open up his mind. He believed that this advanced place would offer him more opportunity to upgrade his skills in modern art. The gallery was exhibiting three pieces of Norbu Tsering's drawings. Two of them were labeled "the Last Supper". He said his intention was to appeal to people's awareness of environmental protection. He stressed, what an artist could do was only to put forward questions, but to resolve problems one must rely on awareness and the actions of the whole society. Norbu Tsering informed me that they were on the way to design and prepare for a series installation artworks regarding education issues in China. A gallery named Tibetan Art Summit, the same size as the Thangka Art Village is situated at the southeast corner of Barkor Street. The owner came from the hinterland. It seemed those affluent businessmen coming far away from the hinterland attempted to do something special in business. This gallery generally belonged to the second category of galleries, mentioned above. The only difference was that it involved a widened scope of business, such as taking new and old Thangka for display in Nepal, providing artworks to Pai JianYuan Market in Beijing, selling embroidery from Yun Nan and Gui Zhou and also copies of oil paintings and sketches. All were scattered everywhere in the double-storey house, making you feel your eyes could not help you find anything. I still remember that when I was a little kid in school, my teacher instructed me in a way that I could not actually understand, i.e. all successful business was neither done by those with great talent nor simpletons. It seems to me now that somehow it was true, and might also happen in the art gallery business. I believe that, if the owners practice business in good faith, strictly observe business rules, respect the achievements of artists, and guarantee that profits are fairly distributed, the art business in galleries will not be difficult, and it will surely be advanced from small to big and from weak to strong.